I made scones for breakfast yesterday. Rather than make 8 large scones I divided the dough and made two rounds and cut each round into 8 scones. You know how I love your recipe for scones. In fact, I was planning on making a blueberry version this morning! They look wonderful...I never met a scone I did not like! I love Lori's and Ann's today..Double whammy! These look wonderful! I will have to give them a try. You share the most wonderful recipes! Lori, I saw your scones. They look perfect. Linda, I'm with you - unless someone made the mistake of putting raisins in the scones. (I hate raisins). Kate, thank you, what a nice thing to say. 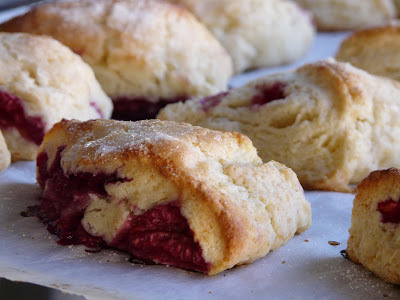 I have off tomorrow, I need to make these scones! Those look so good! 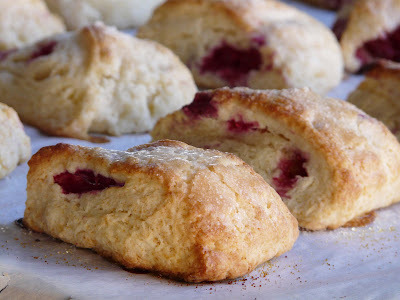 I just made a batch of raspberry white-chocolate ones using a sourdough scone recipe I found on Wild Yeast. ooh and I made your raspberry pie yesterday - Jason was in HEAVEN!